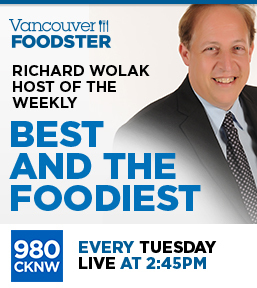 Welcome to the Vancouver Foodster Cookie Challenge. 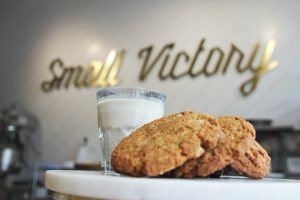 Restaurants, bakeries and cafes from all over the city were invited to enter their Cookie creations into this challenge. 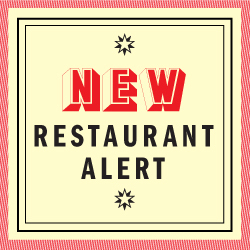 Each restaurant, cafe and bakery will be featuring their cookie creations on their menu from April 19 – May 12, 2018. How Does this all Work? 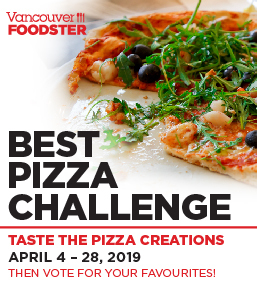 For the public challenge, you are invited to go out and order any or all of the cookie creations in this challenge, then you decide who you think has the best cookie creation for the People’s Choice award winners. 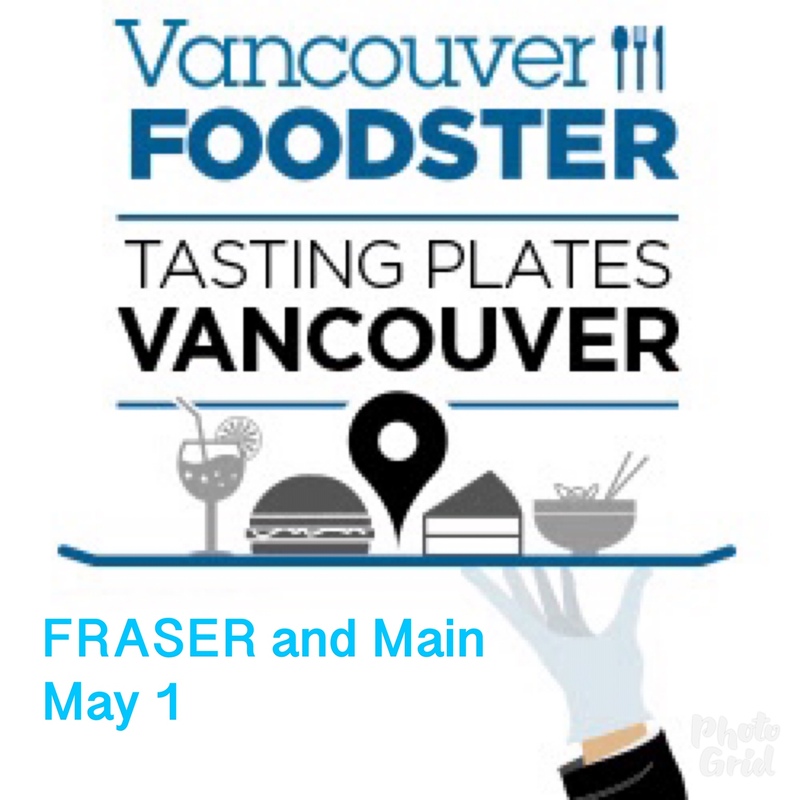 Share your experiences: Tweet (and don’t forget to tweet or instagram your photos) throughout the challenge, our twitter and instagram address is @vanfoodster and the hashtag is #CookieChallengeYVR please include this hashtag in all your tweets during the challenge. 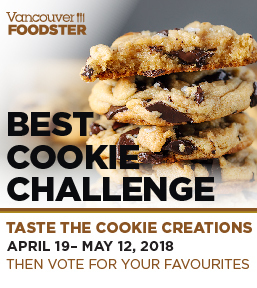 Voting criteria – some things to help you judge your favourite cookie creations – keep these things in mind: originality, creativity, uniqueness, traditional, non-traditional, price, value and most importantly taste. Here are the Cookie creations in this challenge, listed in no particular order other than when they were received by us. 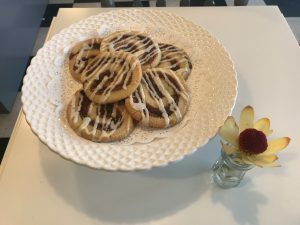 Description: This cinnamon bun cookie is inspired by our best selling baked good… our cinnamon buns. A chewy sugar cookie with a cinnamon filling and our cream cheese icing come together to create the perfect treat. 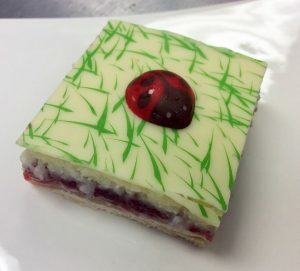 Description: it is made of a butter cookie base with a raspberry jam, the on top, a decadent white chocolate ganache with coconut. 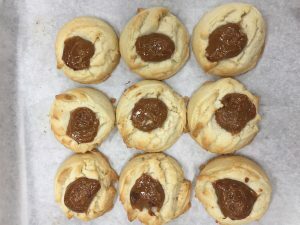 Description: Two chewy sides of cannoli flavoured macrons with the filled center of a mascarpone and cream cheese filling, roasted almonds and chocolate chips, light dust of icing sugar. Description: Soft, chewy and oh so delicious. This classic White Chocolate Macadamia Nut Cookie is made with a blend of flour including an organic coconut flour. 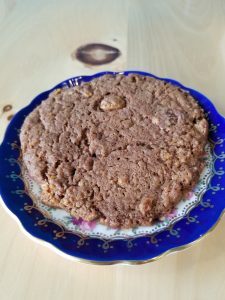 Mix in some roasted macadamia nuts and some sweet white chocolate… this cookie is a cookie lovers dream. 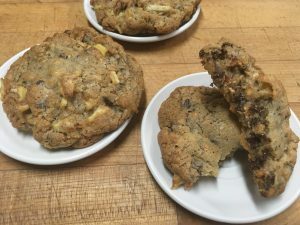 Description: The Mystery Cookie is a play on the “Compost Cookie” from Christina Tosi, Momofuku Milk Bar. We tweaked the ratios and added a couple more of our favorite ingredients. We called it the Mystery Cookie because you would never be able to guess all the ingredients. 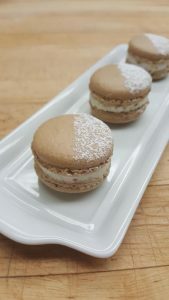 It’s unassuming in appearance and you can’t tell which ingredients are in each bite. We would never have thought that this combination of flavors would taste quite so delicious and become slightly addictive. It’s salty, sweet, crunchy and chewy all at once. They pair well with a glass of cold milk or a strong coffee. 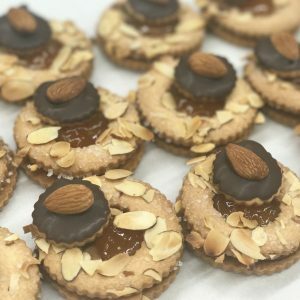 Description: Who says Shortbread is only for Christmas  put a spin with dulce de leche to add just amount of sweetness to the buttery ness of this crisp on the outside and melt in your mouth. Make sure you pick up one of the Cookie Challenge postcards available at each of the participating bakeries and cafes. 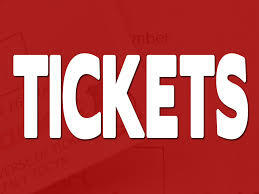 Remember to Vote for your favourites daily, all the voting details are here.